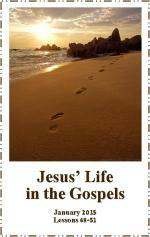 Lesson Goal: To see and understand that Jesus uses “real folks” to carry out His plans. We commonly think of John as the apostle of love, but he certainly did not begin with that kind of reputation, nor did James his brother (Mark 9:38-41; 10:35-39; Luke 9:54-55). It is encouraging to see what Jesus was able to do with such a diversified group of unlikely candidates for Christian service. There is still hope for us! In years past at Mars Hill Baptist Church, we have presented “The Living Last Supper” during the Easter season. Most of us are familiar with Leonardo da Vinci’s mural painting The Last Supper. In this mural, Jesus and His disciples (apostles) are gathered together around the table for a meal referred to as “The Last Supper.” Picture this scene in your mind, as I offer you scriptural facts about the men gathered around this table. Bartholomew (also called Nathanael). The Life Application Bible Commentary explains that in Mark’s and Matthew’s list of apostles, Philip and Bartholomew are listed together (Matthew 10:3; Mark 3:18); in John’s Gospel, Philip and Nathanael are paired together (John 1:45). Thus, Nathanael and Bartholomew must be the same person. Please read John 1:45:46. Nathanael (Bartholomew) was introduced to Jesus by Philip, but notice Nathanael’s initial response to Philip’s words. ⇒ Why do you think Nathanael responded to Philip in such a way? Nathanael had to overcome some of his own biases and prejudices. Philip’s response to Nathanael’s question concerning Jesus was simply: “Come and see” (John 1:46). In the presence of Jesus Christ, it did not take Nathanael long to find his life forever changed by Jesus’ words and power (John 1:47-51). Bartholomew (Nathanael) is an example of a sincere man who, upon the evidence shared by Philip and Jesus Christ, turned from his own self-bias to faith in Jesus. Bartholomew became known in Christian history for his deep conviction and devotion. Simon The Zealot belonged to a group of religious Jewish extremists who were enemies of Rome and wanted to revolt against Roman rule. “The historian Josephus called these zealots ‘daggermen’” (Wiersbe). Some of the zealots were so extreme they were viewed as assassins of Rome. As his name indicates, Simon The Zealot was enthusiastic, fiery, and passionate for his cause. As a zealot, he surrendered his life to Jesus Christ; therefore, he surrendered his dagger for a cross. James The Son of Alphaeus—Mark gave him the title “James the Less” (Mark 15:40), probably to distinguish between him and James the brother of John. James the Less often did his task and service unnoticed. He did not seek fame but rather sought faithfulness. ⇒ James the Less represents all those faithful workers who do their jobs behind the scenes. They are not in the spotlight of service, but faithfully and honorably serve Jesus, often unnoticed. Who are some of these faithful servants at Mars Hill Baptist Church who wear the apron of humility (1 Peter 5:5)? Thaddeus was also known as Judas (not Judas Iscariot). Judas was a very popular name during Jesus’ time. John wanted to clearly identify this Judas as not Judas Iscariot (see John 14:22). The name Thaddeus means “full heart.” Thaddeus was known throughout Christian history for his courage. Andrew-brother of Simon Peter. He and Peter were partners in a fishing business. His name, Andrew, literally means “brave or manly” and appears thirteen times in the Gospels and Acts. It was Andrew who led his brother, Peter, to Jesus Christ. Andrew was apparently the first disciple of our Lord. “Tradition says that Andrew preached in Jerusalem and was crucified for preaching against idolatry. He was hung on a cross in the shape of an X” (Preacher’s Outline and Study Bible). It should also be noted that on three separate occasions, we find Andrew bringing someone to Jesus. Andrew was a soul winner. He had a passion to bring others to Jesus. God help us all to be more like Andrew who seemed always to be bringing someone to Jesus. ⇒ How long has it been since you told someone about Jesus? ⇒ How must it have been to be Peter’s brother? ⇒ How were Andrew’s and Simon Peter’s personalities different? Matthew—We have already studied a bit about this man’s coming to be a disciple of Jesus Christ. Matthew was first called Levi. He was a tax collector. In his own writings, he calls himself a publican. This was perhaps Matthew’s way of offering his personal testimony that there was no more unlikely candidate for apostleship than himself. His profession made him fiercely disliked by the general public. His job was quite lucrative and simple; the more he cheated people, the richer he became. Matthew had probably heard about the fishermen who had followed Jesus and about Jesus’ power even to forgive sin. But did he ever think Jesus would call him? Upon Jesus’ calling, Matthew left his old life behind. He closed his tax ledger, put down his quill, shut up his tax booth, and followed Jesus. After surrendering to Jesus Christ, Matthew wasted no time in bringing others to hear what Jesus could do in their lives. Matthew became one of the great examples (living proof) of Jesus’ power to change lives. He could present the greatest evidence of all—a changed life. Matthew saw the importance of reaching people in his circle of life with the love of Jesus Christ. He also teaches us to look outside our own tight circles of life to those who need the love of Jesus. If we are not careful, somehow these people become invisible to us, but Matthew teaches us that they are all around us. They are the people we work with, associate with, sit in the bleachers with, work in the concession stand with. They are our neighbors and friends; they are parents of our children’s friends. They sit at the same table with us at Kiwanis, Rotary Club and VFW. They just need someone to love them enough to invest in building a relationship that shows them the love of Christ. We can show this love by inviting them into our homes, by inviting them to our Life Focus fellowships, by going out to share a meal. Pray and ask God, through the Holy Spirit, to show you how you can be a minister like Matthew. And please do not limit the Holy Spirit. ⇒ Share how God can use you or your Life Focus class to do Matthew Ministry. Next week we will conclude our study on the lives of the apostles.